I just finished the most wonderful vacation on the east coast with my beautiful grandson, Levi! It was such a joy every morning waking to a little guy calling me, his grandma, “Me-Me.” Yep, he came up with that name all by himself…smart young fella! Now I can tell you I don’t mind the name “Me-Me” one bit. I kinda think it fits me perfectly! It was tough leaving, but now that I am back from my visit and it’s time to bring to you the tasting notes for wine “In My Glass Tonight”. It was a long flight home, leaving Washington-Dulles International Airport around 7am EST to Long Beach, CA then to Oakland International. But it was all worth it. My flight landed in Oakland around 2pm. I was a little tired to say the least but ready to get back to my routine. 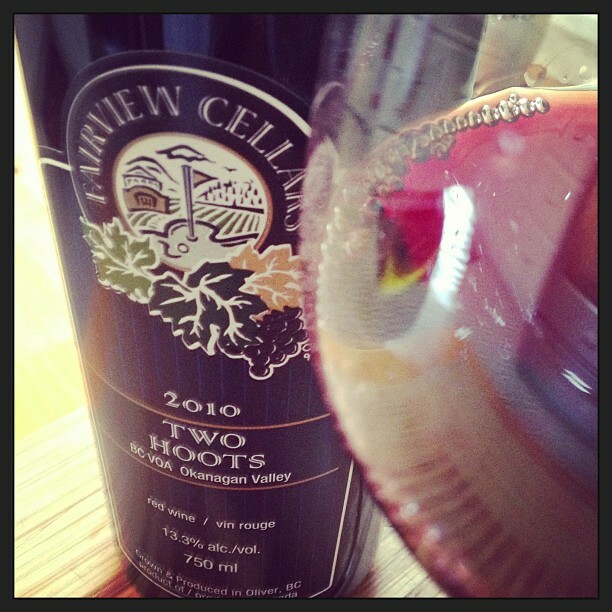 I went to the cellar to find something for the evening and pulled out the Fairview Cellars 2010 Two Hoots Red Wine. While visiting friends in BC, Canada, I had the wonderful opportunity to visit the winery and purchased the bottle for around $24. Alcohol 13.3% by volume. This wine is a blend of 50% Cabernet, 30% Merlot, and 20% Cab Franc. I met the winemaker, Bill Eggert. He gave us a tour of the winery and we tasted through his wines. Two Hoots was named for the Green Horned Owls that come to nest every year on the property. This wine was a little lighter than most red blends making it very drinkable now. I am thinking it could benefit from some age in the bottle and wish I had bought two bottles. It had blackberry, vanilla, current, a slight spice and oak aroma. On the palate I found blackberry, blueberry, slight cherry, current, soft tannins and balanced acidity.